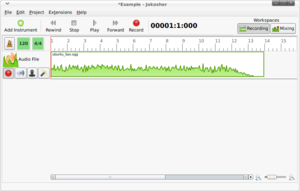 Jokosher is a free software, non-linear multi-track digital audio editor, which is released under the GNU GPL. It is being developed in Python, using the GTK+ interface and GStreamer as an audio back-end, initially just for the Linux operating system but now also with support for Windows. It was released to the public on 21 July 2006. Version 0.2 was publicly released on 20 November 2006 and it included support for extensions, LADSPA effects, and many bug fixes. Development seems to have stopped since April 2012. At the beginning of 2006, Jono Bacon was dissatisfied with the available free and open source Linux multi-track editors, and used Cubase instead to produce LugRadio, a Linux fortnightly podcast. He later on conceived the idea of what initially was Jonoedit. The name Jokosher came later, a pun on the fact that his name contains the phrase "no bacon". The aim was to create an open source multi-track editor that was easy to use, so the user did not require an understanding of multi-track recording. Using LugRadio, his blog and the various planet aggregators connected to it, a community came together to form the Jokosher art, coding, documentation, and packaging teams now working on the project. The interface aims to use concepts familiar with the artists and musicians that use the program. This means that the user doesn't have to have a great deal of familiarity with multi-track editors to be able to record. In Jokosher, there are tools for splitting, trimming and moving, when editing. During the mixing, multi-track volume is available with VU sliders. Audio-tracks are called "instruments" in Jokosher. A range of instruments can be added to a project, and instruments can be renamed. Instruments can also be muted and soloed easily. Jokosher can import audio from Ogg Vorbis, MP3, FLAC, WAV and anything else supported by GStreamer into projects. After recording, it can export back to any of these formats. At the moment,[when?] any version of Jokosher needs either the latest version of GStreamer and Gnonlin installed, or a Concurrent Versions System (CVS) checkout of GStreamer and Gnonlin compiled. This is because the newer versions of Gstreamer have features of which Jokosher is taking advantage. It also introduces many bug fixes that previously were blocking Jokosher from any kind of release. The Jokosher development team has contributed greatly to the GStreamer development. ^ Jokosher >> Blog Archive >> Jokosher 0.2 Released Archived 5 December 2006 at the Wayback Machine - Website news announcing the 0.2 release of Jokosher, and features. ^ jonobacon@home >> Building the Perfect Audio Editor - Blog post announcing the direction of the project. ^ InstallingCvsGstreamerJokosher Archived 7 November 2006 at the Wayback Machine - Wiki page describing how to install CVS Gstreamer for use with Jokosher. This page was last edited on 5 April 2019, at 19:31 (UTC).